The hive scale is now at 185 lbs. That is up from Sunday at 174 lbs. How long does it take for a Bear to go through a fence? The bear was unsuccessful as the inner fence was electrified. I checked my hive scale today. The hive has lost two lbs from last Sunday. 174 lbs. I had some questions from beekeepers about some colonies not building up. I think what many people are missing is the question Is there pollen in the hive? A beekeeper stopped by and told me he fed some pollen patties last week and the bees were all over them. No pollen in a hive can make a queen stop laying. I had mostly dead outs in my colonies and there was ample pollen to start my colonies. I still had pollen patties on into late May but did not replenish any. There was still pollen in the colonies last time I checked. I would be checking for this if a colony was not building up. I have posted two videos about the two new mitecides. Both of these products can by used during the nectar flow. Knowing the miteload of the colony before treatment will tell the beekeeper to treat or not. This is the video by the Hopguard manufacturer. Remember to read and follow all directions on the products label. Always wear the proper personal protective equipment. This is the video of how to put in Mite Away Quick Strips from NOD Apiary Products. 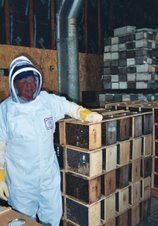 A beekeeper needs to read the complete label on the product and follow the proper installation method and wear the appropriate personal protective equipment. This colony unfortunately has starved. They consumed their stores of honey and the flow has not started yet for many of us. In a normal season this would not have happened. It appears many beekeepers are getting caught off guard to their colonies starving out. 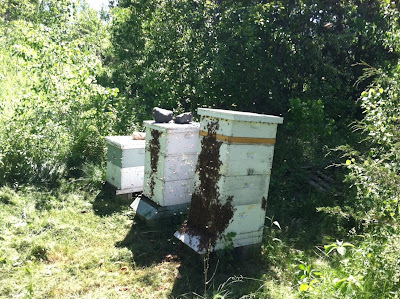 I have talked to several beekeepers about their hives not building up. As the conversation continued a common thread emerged. They had stopped feeding. Two of the beekeepers had a lot of brood but there was no new comb being built. Also the nectar that was in the second box was gone. I told them that they are on the verge of starvation. The big nectar flow has not arrived for most beekeepers and we have to watch the food stores. Another beekeeper after some discussion had his new package swarm. They were in two deeps with two drawn frames in the top box. No nectar coming in, rainy conditions, a forlorn outlook for the hive. Swarming to them was a good prospect for bluer horizons. The bees are into survival so when conditions are bleak they will react. Feeding is a must when drawing foundation. 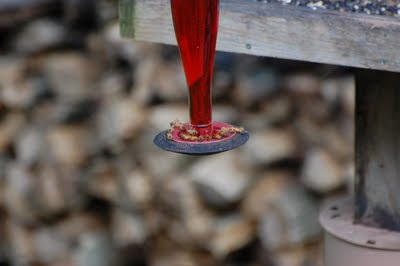 The feeding schedule is feed until the comb is drawn or the nectar flow starts and the bees stop taking syrup. On drawn comb colonies, it is imperative that enough food is available. It is also important not to overfeed but two frames of capped honey in a colony is a good number to maintain leading up to the nectar flow. The cold weather we have experienced has caused the bees to cluster. The bees are trying to keep the brood warm and getting to honey stores in a colony becomes a little more difficult. The spring build up this year has been tough for many beekeepers. Hives have been having problems expanding the brood nest. Populations have suffered and many colonies have not been able to build to a strong hive. Hopefully some 80's will come by next week for a sustained period. I have two queens left. This will be the end of my queens for 2011. The rainy weather is a swarm cooker. A strong colony cramped inside a hive is really thinking "We think it is time to leave". Not much nectar coming in + crowded hive = swarm. When the weather breaks it is important to look for swarm cells. I still don't have much nectar coming in. The nectar flow is taking its time of kicking into gear. The nectar flow will turn the swarm cooker on to low heat so I hope it starts soon. My daughter was recently in Singapore. At the breakfast buffet they had a frame of honey. It looks like they scratched open part of the frame and let it drip into a catch tray that went to a bowl. Very nice presentation. A unique way to serve honey that would be very popular with the breakfast crowd. I have added a sure fire way to know if there is a nectar flow going on. It is a platform scale. These are simple to use and should help take the guess work out of how the hive is performing. The hive weight on Sunday June 12th was 170 lbs. Today the hive weight is 176 lbs. There is nectar in the supers. I know that the hive has a nectar flow going on. I see Yellow Sweet Clover has exploded in the ditches around 494 and the airport. This type of clover, I have been told, doesn't produce much excess nectar in the twin cities area. This is because it is too humid here. But this is a major honey crop west of here as it is a drier climate. But it is good to look at the clover blooms and see if the bees are working them. I am going out today to put honey supers on all my colonies. Some of them aren't quite ready yet but better to put them on early than late. The package bees from the first load have built up very nice, the second load is a little behind but I anticipate they should all be ready to make some honey when the nectar flow starts. The thing that catches many beekeepers by surprise is how quick a hive can put up honey and draw comb. Waiting for the bees to draw out the first box took a month. Then the second box took around three weeks. But now there is getting to be a good population. When a beekeeper adds a third box, this box can be drawn out in ten days. If there is a strong population and a strong nectar flow a hive can easily fill a super, drawn out and capped in a week. So it is important to be ahead of the bees. This morning, Bill Hudson, reporter, from WCCO TV, was over to shoot a segment on Allergies and Honey in my bee yard. It will be broadcast this Thursday night ( June 9) on the 10pm news. Probably will be a short segment so if you miss it, it will be on their website. I was driving around Stillwater today and noticed the Black Locust trees in full bloom. This is a reminder to check any strong hive for the need to put on honey supers. 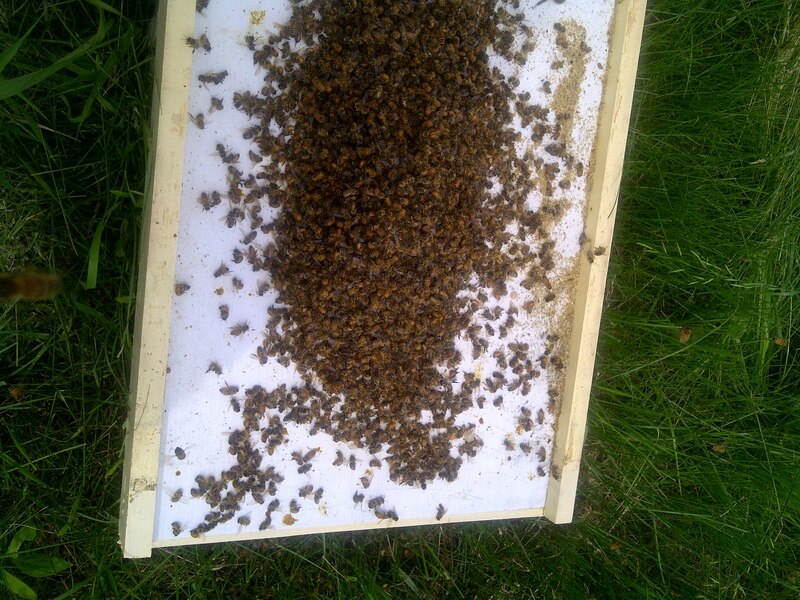 A beekeeper e-mailed me this photo of an over-wintered hive. It was taken on a hot day last week. The over-wintered colony is on the right, a package from the first load is in the middle, a dead out on the end. 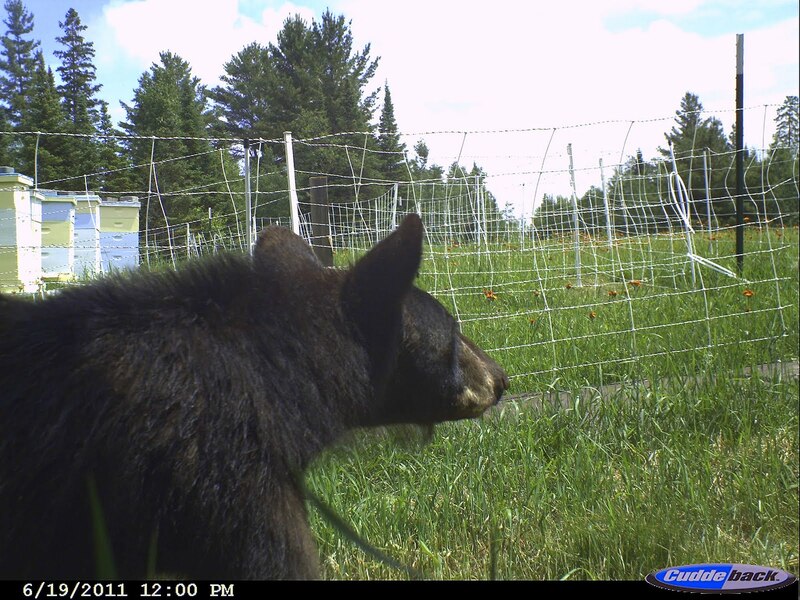 He is planning on switching the hives with each other, over-wintered position with the package position. The over -wintered colony will get weaker and the package will get stronger. He also plans to move two or three frames of brood from the overwintered to the package. This is a good strategy, he will end up with two strong colonies right before the nectar flow. Swarming is still a concern but it is less likely. 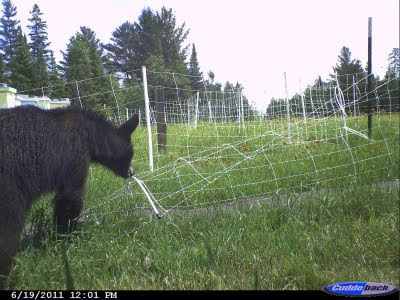 The grass is cut and this helps keep down swarming. This is what typical swarms cells look like. Peanut shaped, usually on the bottom of a frame but not always. When the queen cells are capped, the bees swarm with the old queen. This is why the 10 day swarm cell inspection is important. With this schedule swarm cells can be scraped off before they are capped. If the bees swarm and there are just queen cells hanging there, installing a new queen will get the bees going again much faster than waiting for a queen to be mated and start laying eggs. Notice the cells with the cappings sticking out away from the frame. Those are capped drone cells. The heat has one of the two colonies behind my house hanging outside the hive in large numbers. The entrance reducers were still in. These were first load bees and starting to get a good population. With the upcoming 90's forecast for next week the swarm season is about to begin in earnest. 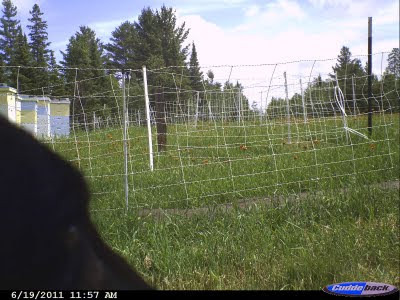 Hot days, crowded hives, tall grass in front of the hive. All of these will contribute to swarming behavior. The best thing to do is remove entrance reducers in the stronger hives, keep the grass cut, ease overcrowding of over wintered colony by divides or by switching colony positions with a weak colony. Also begin a every 10 day regimen of looking for swarm cells. Remember a no more than 10 day schedule. A longer time between checking will make swarming very likely.